Bhai Sahib saw Babbu standing on his roof with his rifle, Bhai Sahib shouted, “Police is behind me.” Babbu gave the signal to pass, but as soon as Bhai Sahib came into his range, Babbu lifted his riffle and aimed it at Bhai Sahib firing bullets into his chest. Inside the house, Jhujaru Singhs sitting with their assault rifles and preparing to taking langar made by Mata Surinder Kaur, she would always show love to Jhujaru Singhs as she saw her son in them. This mother had lost her son Bhai Kuldeep Singh in the armed Sikh struggle, he had left no photos of himself which his mother could remember him by. 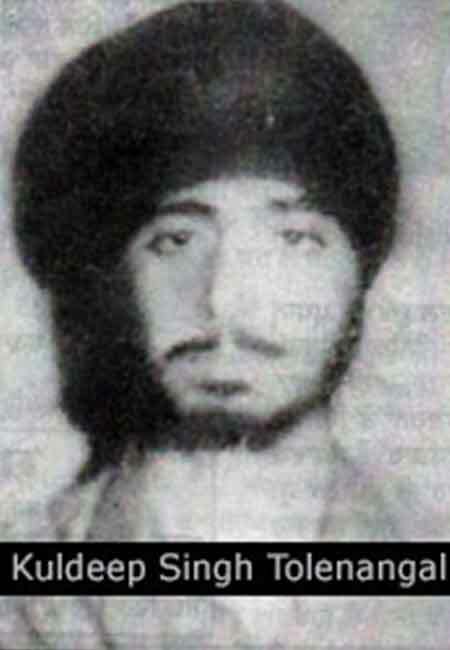 Bhai Sahib had not allowed anyone to photo him, so the Indian could never put a face to his name. In the village of Tolenangal which is in the Amritsar district lives Sardar Lakha Singh who is married to Mata Surinder Kaur. Bhai Sahib took birth in this family in 1968. Bhai Sahib was the youngest of 3 brothers and 2 sisters, Bhai Nirmal Singh, Bibi Charanjit Kaur, Bibi Paramjit Kaur and Bhai Ranjit Singh. The blessing of Shaheedi was given to the 5th child Bhai Kuldeep Singh. Bhai Sahib did not study much but from a young age he took interest in the teaching of Sikh Gurus. Bhai Sahib noticed the injustices of the Indian government which the Sikhs were suffering from. And only one man by the name of Sant Jarnail Singh Ji Bhindranwala spoke out to against these injustices. Soon Bhai Sahib would regularly start attending speeches of Sant Ji and meet him too. In June 1984 the government sent their army equipped with tanks, cannons and helicopters to crush the voice of Sikhs by attacking to Sri Harmandir Sahib. At that time Bhai Sahib was only 16 years old. All over Punjab Indian solders were guarding each corner of each street. Brave but unarmed Sikh youth could not do much in front of heavily armed Indian soldiers, but these youths could not sit at home knowing Sri Harmandir Sahib was under attack. To stand up to the aggressive army Bhai Sahib and Bhai Satnam Singh Sheena left their house and told the families, “We are going to Masaya.” But the truth was they left their homes to stop the Indian army causing more damage to the Sikh panth. They started looking for Jhujaru Singhs to join them and enter the battlefield. Days weeks and months had passed these true Singhs did not return home. Mother’s message reached her son and Bhai Sahib along with Bhai Satnam Singh Sheena came to see Mata Surinder Kaur. The family members were shocked to see the change in Bhai Sahib’s personality. There was a time when Bhai Sahib used to be naughty and now he was all serious. On this day Bhai Sahib and Bhai Sheena were unarmed, but they had to arrange weapons for themselves. In search of weapons, both Singhs went to Sri Harimandir Sahib and were looking for fellow singhs and during this they came under the eye of Amritsar police. Both singhs were arrested and taken to the police station. Here they were blindly tortured, as the police did not know that these Singhs had gone underground, the Singhs gave their real names and said that they had come to do darshan of Sri Harmandir Sahib. Both singhs were mercilessly tortured, but the Singhs stuck to their original story. In the end investigating officers were sent to the villages of these Singhs. And even the villagers gave statements in the favour of the Singhs. Then the police told the families to bring the Panchayats of their village to the police station and take the Singhs. Panchayats freed both of the Singhs. Straight after Bhai Sahib and Bhai Sheena sent there panchayats back to the village, they again started walking on the path of Sikh Freedom Movement. Amongst the group of Jhujaru Singhs was Bhai Gurmail Singh also from Tolenangal. Bhai Gurmail Singh’s brother Bhai Harnam Singh was a good friend of Bhai Sahib’s brother Bhai Ranjit Singh. Bhai Harnam Singh had told Bhai Ranjit Singh that Bhai Sahib and there group will be visiting the local Gurudwara in the evening where a Singh by the name of ‘Anteryami’ will give them weapons. Bhai Ranjit Singh and Bhai Harnam Singh planned to meet their Jhujaru brothers and went to the Gurudwara before the evening. It is important not to tell anyone your secrets, if you tell your secrets to a close friend, then that friend tells the secrets to his close friend and sooner or later there is no secret. On that point, if the brothers of Jhujaru Singhs knew of their visit to the Gurudwara, then others must have also known. This information had reached CRPF too. The CRPF had the whole area surrounded, they were acting like lions, as they were told that the Jhujaru Singhs would be unarmed. On the other side, Bhai Ranjit Singh and Bhai Harnam Singh reached the Gurudwara thinking they would meet their Jhujaru brothers. The Giani had just finished doing Sri Rehras Sahib and the Jhujaru Singhs had also reached the Gurudwara. Straight after that, the heavily armed CRPF officers tightened the curfew and before entering the Gurudwara, they shined the light into the Gurudwara. The Singhs were in the langar hall, Bhai Sahib opened his hair and got rice and dhaal from the langar. Bhai Sahib put dhal on his face as if he was a disabled person. The CRPF managed to get to the weapons and now started to arrest Singhs. CRPF managed to arrest all of the Singhs beside Bhai Sahib. As CRPF only saw him as a disabled person, but at the same time Bhai Sahib remained calm in this intense situation. Amongst the Singhs that were arrested were Bhai Satnam Singh Sheena, Bhai Gurmail Singh Tolenangal and Bhai Sukhwinder Singh Kot Ramdas. The CRPF also arrest Bhai Ranjit Singh and Bhai Harnam Singh who had come to meet their brothers. No matter what Bhai Ranjit Singh and Bhai Harnam Singh said the CRPF did not let them go. After that the CRPF took the Singhs out of the gurudwara premises. Bhai Sahib vacated the area from the back entrance and escaped. When the CRPF lined the Singhs up, Bhai Sheena pushed an officer and ran into the fields surrounding the Gurudwara. Straight after the CRPF started firing in the direction of Bhai Sheena. When the CRPF fired bullets, the CRPF inside the gurudwara thought the Jhujaru Singhs had attacked them. So they started firing bullets towards their own force which was outside and the CRPF on the outside thought the remaining Jhujaru Singhs inside the gurudwara started a battle against them. Bhai Sheena and Bhai Sahib escaped the area as the CRPF fought amongst themselves. After a month when these Singhs were handed over to Ajnala police the family found out that the Singhs are still alive, as they had thought the Singhs had been killed. Even the Ajnala police used brutality to frame Singhs but in the end they were sent to Amritsar jail. On the other side, Bhai Sheena and Bhai Sahib came in contact with Bhindranwala Tigers Force of Khalistan’s chief, Baba Gurbachan Singh Ji Manochahal. Bhai Sahib and Bhai Sheena received weapons and started doing Jhujaru actions in their area. The comrades of Sheena village were aggressively preaching against the Jhujaru Singh. The majority of these comrades had become dogs of the government. Going one step further they had even been given weapons by the government and had established their own armed gangs. The Jhujaru Singhs had to tackle this arising problem head on. One of the comrades called Babbu from the village of Sheena, he had used his gang to abduct a Hindu girl who he raped in front of everyone. Even then he was loved by the government and remained the informant of the police. When the Jhujaru Singhs would pass the village at night, he would run to his roof and fire bullets into the air to alert the police, at times he would fire bullets into the air for no reason. The Singhs took Babbu to Gurudwara, where he swore not to harass anyone, then the Singhs allowed Babbu to live and after the Jhujaru Singhs passed Sheena village without any hassle. Babbu had also stopped firing bullets. On 7th December 1987, the Singhs were surrounded by the Indian security forces in Sheena village. Bhai Sahib, Bhai Sheena and Bhai Jagtar Singh Jagga Lapoke were all sitting at the Sheena village river. Sometime after Bhai Sheena went into his village to pick up clothes and newly made Kachere. As Sheena was to enter the village, the Indian security forces entered the village from the other side. The forces of India tried to capture Bhai Sahib and Bhai Jagtar Singh Jagga but both Jhujaru Singhs grabbed their assault rifles and started to battle against the troops of India. Moving and battling the Indian security forces, Bhai Sahib and Bhai Jagga entered the village of Harsha Sheena. Bhai Sahib guided Bhai Jagga onto a path that leaves the village and he himself went into the village as he fired bullets. This was done to get all the Indian troops to focus on him while Bhai Jagga escaped. The escape route of Bhai Sahib was blocked by the house of comrade Babbu, Bhai Sahib thought that he and Babbu had put their differences aside and it was okay to use Babbu’s house to escape as Bhai Sahib was running from roof to roof. Bhai Sahib saw Babbu standing on his roof with his rifle, Bhai Sahib shouted, “Police is behind me.” Babbu gave the signal to pass, but as soon as Bhai Sahib came into his range, Babbu lifted his riffle and aimed it at Bhai Sahib firing bullets into his chest. A warrior of Bhindranwala Tigers Force of Khalistan had been killed by a fraud. After the Shaheedi of Bhai Sahib, Bhai Satnam Singh Sheena and Bhai Resham Singh Sheena with the help of Bibi Jasmeet Kaur kidnapped Babbu and decapitated his head. The singhs hung Babbu’s head on a wall in front of the same police station that gave him protection. Mata Surinder Kaur was not upset about her son being a martyr, she was upset due to one reason only because there were not many photos of Bhai Sahib. Bhai Sahib would not allow anyone to photograph him. Mata Surinder Kaur would always take photos of Jhujaru Singhs who would come to her house for langar. Finally Bhai Satnam Singh Sheena had a photo of Bhai Sahib delivered to him from where the group of Singhs had received their training from, and that photo of Bhai Sahib became a diamond for Mata Ji, which she kept very close to her heart.